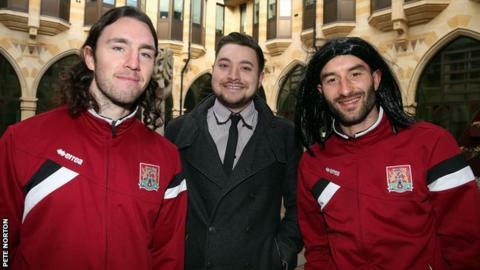 It started off as a joke between a group of friends, but on Saturday hundreds of Northampton Town fans will don wigs and headbands to mark John-Joe O'Toole Day. More than 1,000 Cobblers supporters are making the trip to Mansfield, many of whom will be getting dressed up in honour of the 26-year-old midfielder. Fan Dan Pearce had initially suggested the idea to friends on Facebook, but he believes more than 100 people have already committed to buying wigs for the weekend. "We'd have still done it if there were six or seven of us. We'd have just looked like idiots," Pearce told BBC Sport. "If even a 10th of the away support do it then that's just fantastic." O'Toole, recognisable for his long, dark hair and trademark headband, joined Northampton in the summer from Bristol Rovers, where he scored 15 goals last season. But the former Colchester and Watford man failed to live up to his initial billing at Sixfields, and was loaned out to Southend at the end of the year. His return to Chris Wilder's side, though, has coincided with a run of five straight wins in League Two, which came to an end with a loss at Hartlepool on Tuesday. Pearce, who is a project manager for a dental company, made sure he received O'Toole's approval this week. "The first thing he asked was 'why? ', which is fair enough as it's probably the most surreal moment of his career," said Pearce. "When John was loaned out, I defended him. He gives the impression he's not interested, the way he walks around the pitch. "But he is possibly the most technically impressive player we have had since Martin Smith. He has the potential to become a real cult hero." O'Toole has helped lift Northampton from 20th in League Two to 13th. "It'll be quite a sight seeing everyone with the big old wigs on," he said. "The lads have been poking fun at me. They've threatened to tie me down and shave off all my hair. "My mum and dad are coming. I don't think they've got wigs yet. "I need to stay focused, but if we win I can celebrate and have a jolly with them afterwards." Fans wearing Marouane Fellaini wigs was a regular sight at Everton, until his move to Manchester United in 2013. West Brom supporters showed their admiration for former boss Tony Mowbray when 3,000 fans donned masks of the manager's face for a trip to Blackburn in 2009. Reading fans thought it was a good idea to honour players Steve Sidwell and Dave Kitson with a Ginger Day in 2004 - but Kitson did not see the funny side, saying "the last thing I need really is 15,000 people all in ginger wigs drawing attention to it"
Who is top of the long-ball table? Read more on Premier League long-ball table - where are Manchester United?